This superior-wearing commercial-grade VCT flooring will provide years and years of quality use! Mannington's Essentials Tangor floors are solidly constructed to withstand the use and abuse of high-traffic, frequently-used areas. An extra-tough 126-mil wearlayer and a 3.2 mm thickness adds extra resiliency and durability. 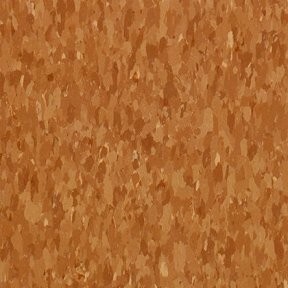 The neutral rust color with alternating flecks of lighter and darker rust colors throughout add a lovely brightness to any room it is installed in. Glue down installation is a breeze with Mannington's Essentials Tangor floors.